He’s called ‘a fool’ indeed! They’re called “unicorns” because they’re “valued” at more than $1 billion. And – as Lyft (Nasdaq: LYFT) and Uber demonstrate – they’re exempt from profit-making. Indeed, it appears that this very exemption from profit-making is what enables the Unicorn Farm to thrive. It’s all about growth “metrics,” like “engagement,” “active users,” and “monthly riders,” even “revenue,” too. Heat-seeking venture capital (VC) means these “burn babies” are virtually free to spend themselves senseless. And funding round after funding round often allows them to buy bigger and bigger growth metrics. When they’re big enough, founders, VCs, and Wall Street vampire squids ride these unicorns to billion-dollar exit strategies known as initial public offerings. There were about 30 unicorns in the U.S. back in 2012-13. They had a total “private” value of approximately $50 billion. Today, there are 138. And they’re valued at more than $500 billion. That’s just the U.S. There are more than 265 valued at $860 billion on a worldwide basis. With each new round of private funding, they get to pump up their value. And, yet, through funding rounds recorded in 2018, the five largest U.S. unicorns had rarely sullied their records with positive net income. That’s Uber at $72 billion, WeWork at $45 billion, Airbnb at $38 billion, JUUL Labs at $38 billion, and Stripe at $23 billion. That’s $216 billion of valuation… resting on combined 2018 losses of about $10 billion. And Lyft managed to get its shares priced at $72 per share, a $24 billion initial public valuation. It got as high as $88.60 on IPO Day, pushing its market cap near $30 billion. LYFT reached a new post-IPO low today, $57.66, and is trading around $59 early Friday afternoon. And that’s still inflated. The absence of profits puts no crimp on the fabulous growth of valuation on the Unicorn Farm. That’s because “private valuation” is just a number that VC firms agree to conjure higher and higher each time a portfolio company gets a hankering for more cash. Uber’s $72 billion valuation came with its August 2018 funding round. Since then, it posted another quarterly loss of nearly a billion dollars. Today, though, it’s lining up an IPO with a hoped-for initial market valuation of $100 billion. The Unicorn Farm is just another manifestation of malinvestment fostered by monetary central planning. And this distortion intensifies with the bubble cycle’s duration. The longer the Federal Reserve and other central banks keep the public equity markets suspended from a sky-hook, the more audacious the VC industry becomes. Our monetary central planners will never let the Everything Bubble stop expanding, so there will always be an army of retail mullets waiting to scoop up an IPO offering down the road. Central banks have underwritten 10-year spree of buy-the-dip gambling on Wall Street, and they’ve created a toxic financial petri dish in the VC space, where the foolish and the cockamamie are funded to the degree of their foolishness and cockamamieness, it seems. In fact, there is no “profits” discipline, and there is no shut-off valve. And that means tens of billions can be wasted. 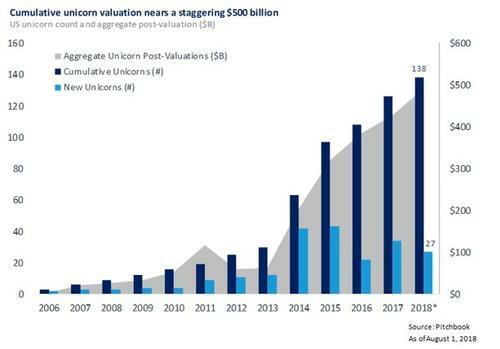 The march from $50 billion to $500 billion of unicorn market capitalization happened because nothing stopped the VC sewing circles from marking up the values of their portfolio companies higher and higher. It’s counterfeiting on a grand scale. During the same five-year period, none of these unicorns – certainly neither Lyft nor Uber – proved that they have a sustainable business model. They only drifted into deeper and deeper losses. The whole thing is make-believe.